Highmount, NY – New York State Governor Eliot Spitzer on Wednesday announced an agreement on a major new ski resort complex in the Catskills – the largest and most environmentally advanced development project in the region in generations – and the protection of over 1,400 acres of land. 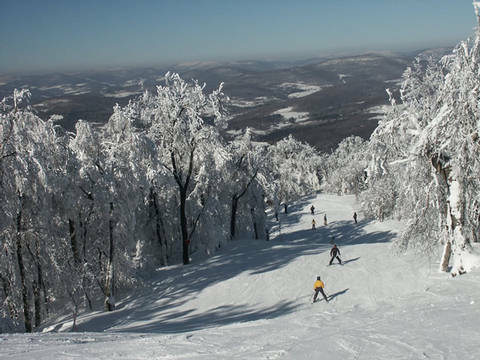 The agreement between Crossroads Ventures LLC, environmental groups, New York State and New York City will end a seven-year legal and regulatory battle and allow the project to move forward, including Belleayre Mountain Ski Center’s connection to the ski trails of the now-defunct Highmount Ski Center, while at the same time assuring strict environmental protections and land preservation. The new resort will be built on the border of Ulster and Delaware counties in the towns of Shandaken and Middletown, adjacent to the state-owned Belleayre Mountain Ski Center. It is located in an environmentally sensitive area of the New York City watershed in the central Catskill Mountains. The project includes two hotels, 259 lodging units, a conference center, spa and organic golf course that will feature ski-in/ski-out recreational opportunities. The projected cost of the project is $400 million. It is expected to create 450 full time permanent jobs, 150 part-time jobs as well as 1,800 construction jobs over an estimated eight-year construction period. With nine million New Yorkers relying on the Catskill-Delaware watershed to provide a safe and reliable source of drinking water, and this area being home to prized trout streams, protecting water quality was a guiding principle of this agreement, signatory parties say. Crossroads Ventures has agreed to scale back the size of the development and to shift all proposed development out of the highly sensitive and impaired Ashokan Reservoir basin. New York State will acquire 1,216 acres of land on the Big Indian Plateau to be added to the State Forest Preserve through a purchase negotiated by the Trust for Public Land. The Big Indian Wilderness Area and the adjoining Slide Mountain Wilderness Area, together make up the largest contiguous tract of wilderness in the Catskill Park. The State will also acquire 78 acres at the former Highmount Ski Center to be integrated into a westward expansion of the state-owned Belleayre Mountain Ski Center, and a NYC Watershed conservation easement on 200 acres of nearby lands. Under the terms of the agreement, a clustered development approach will reduce the total number of acres to be disturbed from 573 acres to 273 acres, or 52 percent. Construction of environmentally sound green buildings will meet specifications set forth by the U.S. Green Building Council. The buildings will obtain certification under the Leadership in Energy and Environmental Design (LEED) program. As part of the plan, one proposed golf course has been eliminated, and the remaining golf course will be redesigned to minimize pollution impacts, including a commitment to organic golf course management. The proposed resort has been substantially redesigned to eliminate the placement of most buildings on steep slopes, while buffering wetlands and streams. The physical disturbance of the land by the proposed resort is reduced by half. Visibility of the resort from wilderness areas of the Forest Preserve will be reduced, design and materials altered to help the resort better fit its surroundings, and the use of lighting designed to avoid potential light pollution. A comprehensive and heightened storm water management design will control and manage runoff, while two proposed sewage treatment plants have been eliminated from the project. Instead, the resort will utilize an existing New York City-owned, state-of-the-art sewage treatment plant in Pine Hill. The total number of the resort’s hotel and lodging units have been reduced from the project’s original plans, thereby reducing resort-related traffic and demands on local water resources. Half a million dollars in state funds will be allocated for local smart growth projects through a new Central Catskills Smart Growth Initiative. Funding is from the State’s Environmental Protection Fund and will be administered by the Department of Environmental Conservation. Separate from this agreement, the state will begin a public collaborative process to explore scenic by-way designation for the Route 28 corridor. Birch Creek and its aquatic habitat will be protected through elimination of the Big Indian Plateau development and a rigorous permit condition limits use of the existing water supply wells in drought conditions. Annual property tax revenue of over $2 million is expected to be paid to the Town of Shandaken and Town of Middletown, local school districts and Ulster and Delaware counties. Annual sales tax revenue to the state and Ulster and Delaware counties generated by the resort is expected to be over $2 million. “I applaud Governor Spitzer for his leadership in developing a solution for the Belleayre Resort project that will help to create new jobs and spur economic growth while minimizing negative impacts to the surrounding environment and protecting the integrity of the New York City watershed,” said New York State Congressman Maurice Hinchey. “When I introduced the lower build alternative for this plan as a starting point for these negotiations almost two years ago, I envisioned a final project that greatly resembled what was agreed to today. “While this project represents a dramatic improvement from what was originally proposed, I still intend to follow the subsequent review process carefully, particularly with regard to its size and potential impacts on the hamlet of Pine Hill,” Hinchey concluded. Dean Gitter, Managing Member of the project sponsor, Crossroads Ventures, LLC, was equally pleased. All of the parties signed an “Agreement in Principle” which lays out the agreement in detail. A Supplemental Environmental Impact Statement will be prepared for public review. All existing laws and regulations and opportunities for public participation will govern the review of the project. A proposed groundbreaking date was not revealed.